I enjoy various aspects of how National Police Week and Peace Officers Memorial Day are recognized here in D.C. Things such as The Annual Blue Mass at Saint Patrick’s Catholic Church and the National Peace Officers’ Memorial Service provide a level of solemnity. And the arrival of the Police Unity Tour, and seeing different National Police Week Vehicles on the streets of the city, are also highlights. But perhaps the most meaningful and poignant aspect of the occasion is the leaving of mementos and tributes by visitors to The National Law Enforcement Officers Memorial. As I walked through the memorial and took in both the memorial and the tributes people have left there this week, I try to imagine the stories behind the items. Some of the items are very official looking, and remind me of the honor due to the officer memorialized there, and the debt of gratitude owed to not only that person but all the others who are also inscribed on the walls of the memorial. Examples of this include plaques, flags and patches. Other items left at the walls are so personal and intimate in nature, such as photographs, letters and stuffed animals, that I feel almost like I’m intruding. I was also particularly moved by the helmet for a police bike officer which someone had left, along with blue and white roses which had been laid on top of it. Regardless of the official or personal nature of the tributes, all of the items left at the memorial add to the experience, and make visiting the memorial during this week especially worthwhile. Finally, as this year’s National Police Week is coming to a conclusion, I’d like to encourage everyone to please take a moment to remember all of the Federal, state and local law enforcement officers who have made the ultimate sacrifice for the safety and protection of our nation, as well as the more than 900,000 sworn law enforcement officers currently serving throughout this country. There are currently more than 900,000 sworn law enforcement officers serving in the United States, about 12 percent of whom are female. These are the highest numbers ever. And according to the preliminary FBI’s Uniform Crime Report from January 2015 to June 2016, an estimated 507,792 violent crimes occurred nationwide, an increase of 5.3%. So with an increasing number of officers dealing with this much violence, which is also on the increase, the consequences can all too often be tragic. Since the first known line-of-duty death in 1791, more than 20,000 U.S. law enforcement officers have made the ultimate sacrifice. As of April of this year there were 21,183 law enforcement officers killed in the line of duty whose names are engraved on the walls of The National Law Enforcement Officers Memorial. This includes 768 officers from New York City, the police department that has lost more officers in the line of duty than any other. Texas has lost 1,706 officers, more than any other state. The state with the fewest deaths is Vermont, with 23. In addition to local law enforcement officers, the total number also includes 1,117 Federal officers, as well as 689 correctional officers and 39 military law enforcement officers. These numbers include 309 female officers, six of whom were killed in 2016, including a local female police officer named Ashley Guindon, who was killed in February of last year on her first day on the job. With this week being designated as National Police Week, and the corresponding activities going on here in D.C. during this time, there has been a significant increase in the number of visitors to the memorial. And many of the visitors include families of the fallen as well as fellow police officers who knew or had a close connection to the officers being honored at the memorial. So with the increased number of visitors with direct connections to the fallen officers whose names are chiseled on the walls of the memorial, the number of tributes being left at the memorial increases during this week. I wrote in this blog last year about Tributes Left at the National Law Enforcement Officers Memorial, but because of the ever changing nature of the visitors to the memorial and the tributes which are left there, I visited the memorial again this year. The following photos show some of the thousands of those tributes. I find them interesting because some are official in nature, such as plaques, uniforms, or even car doors from police cruisers. Others, however, are very personal. These include family photos, letters from children, and even stuffed animals. Cumulatively the tributes show the magnitude of the commitment and sacrifice of the fallen officers, who were more than just names on a wall. They were people. And these people truly deserve to be honored. Note: There was such and outpouring of respect, as evidenced by the number of tributes left at the memorial, that when I finished my visit I realized I had so many photos that it would be best to break it up into a couple of days. So come back tomorrow for part two of National Police Week Tributes. On this lunchtime bike ride, as I was riding through Lafayette Square and past the plaza in front of the north portico of The White House (MAP), I noticed an unusual looking protest. From a distance it caught my eye because the men protesting were dressed in all-white outfits with what appeared to be red stains on their crotches. I also noticed that the demonstration was not only getting a lot of attention, but was also prompting double-takes or shudders from some of the tourists and other passersby. So naturally I rode over to take a closer look and try to find out more. 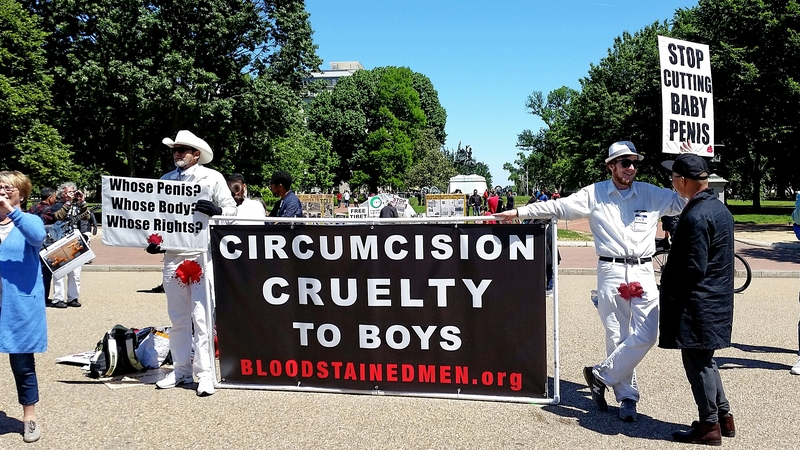 It turned out that the protest was by a group called Bloodstained Men and Their Friends, which is traveling around the country to protest against infant male circumcision in the United States. And they have more than 60 anti-circumcision protests scheduled throughout this year. That includes this protest at the White House. Two of the main Abrahamic faiths, Judaism and Islam, require that males be circumcised, while Christians and nonbelievers are mixed on the topic. Others believe that circumcision has health advantages for men completely separate from religious belief. Both the American Medical Association and the American Academy of Pediatrics have found that the health benefits of newborn male circumcision outweigh the risks, and that the benefits justify access to this procedure for families who choose it. 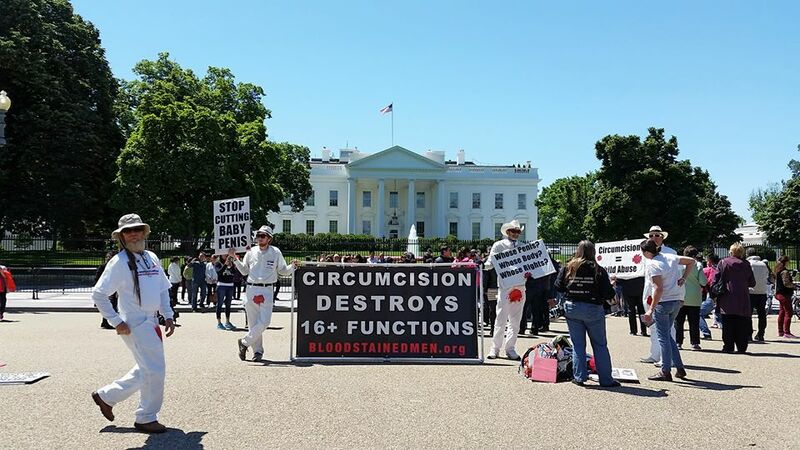 However, the organizers of the protest consider the procedure of infant male circumcision to be a violation of human rights, and want this country to follow the advice of the European medical community, which has condemned American doctors for infant circumcision. They also contend that in the United States, the legality of the practice is a violation of the 14th Amendment. Despite being practiced in many African and Middle Eastern countries as a cultural custom, the Federal government passed a law in 1996 against Female Genital Mutilation. In fact, just this week the Federal Bureau of Investigation, which considers it an international human rights issue, announced on its web site that it is encouraging people to come forward and report cases so that it can proactively investigate this illegal practice. Bloodstained Men contend inasmuch as the 14th Amendment says that the law has to be applied equally, infant boys should be entitled to the same respect of their bodies that girls are. However, the Bloodstained Men philosophy is not strictly anti-circumcision. Although they do not advocate the process for anyone, the group believes the decision on whether to be circumcised should be left to the individual once he is an adult. They also believe that protesting isn’t their main mission. Rather, protesting is a means by which they seek to start a dialogue about the subject in hopes of educating people. By this measure, I think their protest was a success. 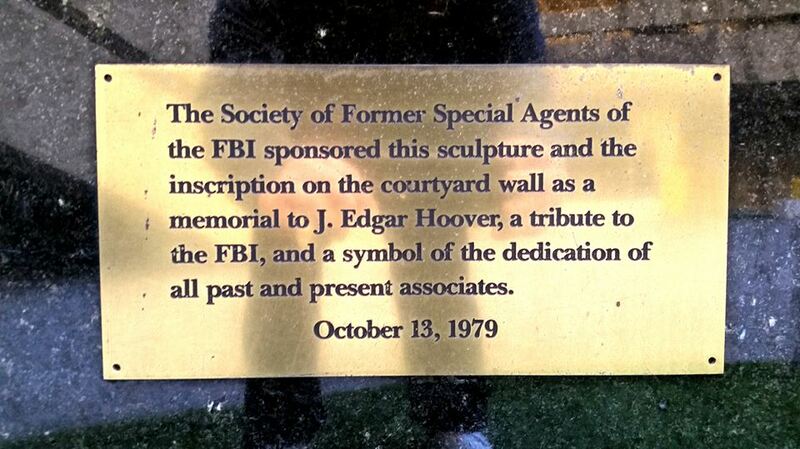 Tomorrow marks the 43rd anniversary of the death of J. Edgar Hoover. After nearly five decades as director of the Federal Bureau of Investigation (FBI), his death left the powerful government agency without the administrator who had been largely responsible for its existence and shape. It was on May 2, 1972, as the Watergate affair was about to explode onto the national stage, that Hoover died of heart disease at the age of 77. After laying in repose in the rotunda of the U.S. Capitol Building, he was buried in a full state funeral on my 10th birthday. And even though I was very young at the time, I remember this happening. 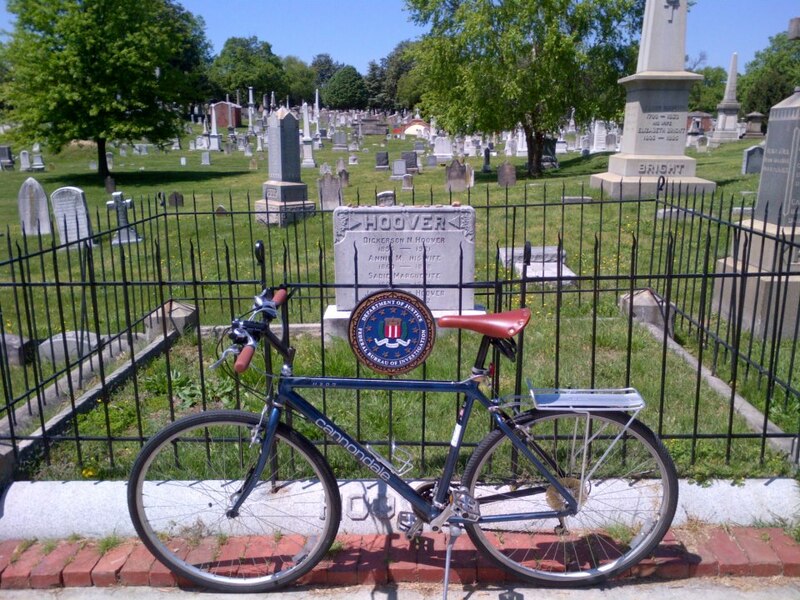 It was in recognition of this event that, as part of this bike ride, I rode from FBI Headquarters, which was named after him, back to Director Hoover’s final resting place in Historic Congressional Cemetery, just a mere three miles away. Hoover was born on New Year’s Day in 1895 in D.C., where he lived his entire life. In light of the recent controversy over President Barack Obama’s birth certificate, it is interesting to note that a birth certificate was not filed at the time Hoover was born, despite the fact that it was required. His two siblings had birth certificates, but Hoover’s was not filed until 1938, when he was 43 years old. Hoover then grew up near Eastern Market in D.C.’s Capitol Hill neighborhood (where I stopped at one of my favorite places for lunch on my way back to my office today). Educated as a lawyer and a librarian at George Washington University in D.C., Hoover joined the Department of Justice in 1917 and within two years had become special assistant to the Attorney General. Appointed in 1924 as the Director of The Bureau of Investigation – the predecessor to the FBI – he was instrumental in founding the FBI in 1935. He then ran the FBI for an additional 37 years. 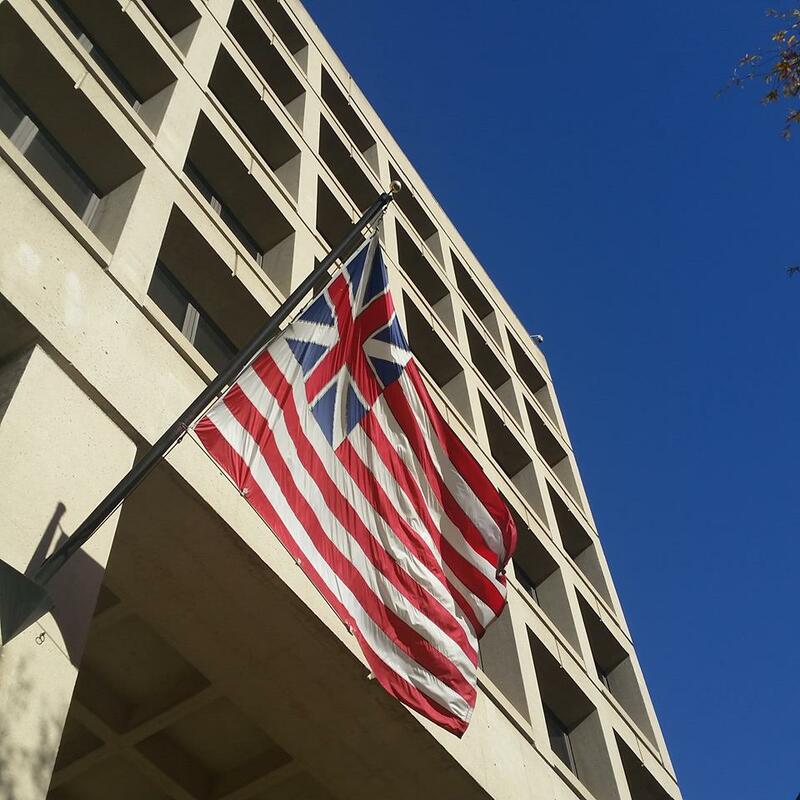 Because Hoover’s actions came to be seen by many in Congress as an abuse of power, FBI directors are now limited to one ten-year term, subject to extension by the U.S. Senate. Late in life, and especially after his death, Hoover became a controversial figure as evidence of his secretive actions became known. His critics have accused him of exceeding the jurisdiction of the FBI. Additionally, rumors have circulated that Hoover was homosexual, which had a distinctly different connotation during his lifetime. 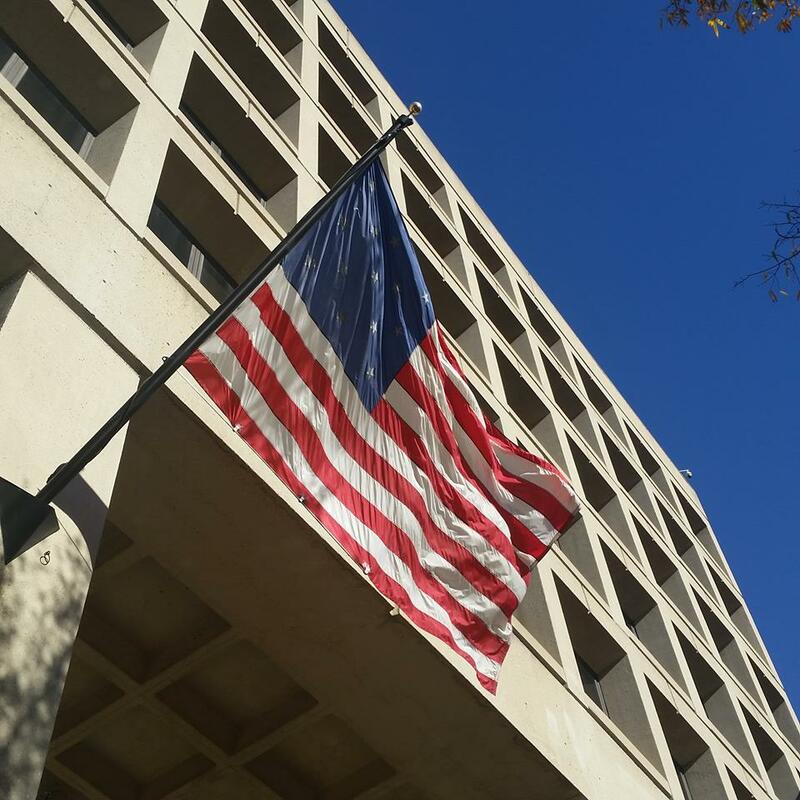 Despite the criticisms and rumors, however, Hoover is credited with building the FBI into a large and efficient crime-fighting agency, and with instituting a number of modernizations to police technology, such as a centralized fingerprint file and forensic laboratories. 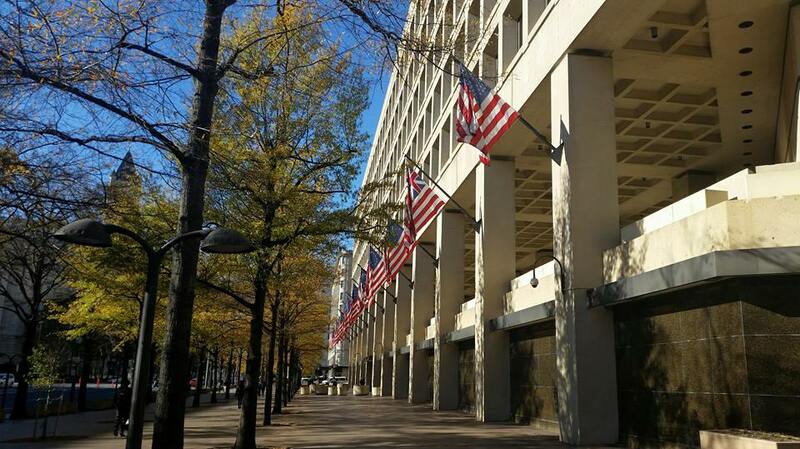 The J. Edgar Hoover FBI Headquarters building is located at 935 Pennsylvania Avenue (MAP), occupying a full city block of prestigious real estate approximately halfway between The White House and the U.S. Capitol Building in D.C.’s Downtown neighborhood. Unfortunately it has not been accessible to the public since 2001 when the Bureau immediately suspended public tours in the wake of the September 11th terrorist attacks. Among its many amenities the brutalist 2,800,876 square-foot structure contains, or has in the past contained: an auditorium and theater; three below-ground floors, which include a gymnasium and a two-story basketball court; an automobile repair shop, an eighth-floor cafeteria with outdoor rooftop patio dining; an indoor firing range; a pneumatic tube system and a conveyor belt system for handling mail and files; a film library as well as developing laboratories for both still photography and motion pictures; a cryptographic vault; an amphitheater; jail holding cells; classrooms; 80,000 square feet of laboratory space; a printing plant; a medical clinic; a morgue, and; a gravel-filled dry moat which parallels the sides and back of the building. Unfortunately, the public may never again get the chance to tour the building inasmuch as plans are being made to abandon it and move to a new headquarters building outside of the city. Structural and safety issues with the building starting becoming apparent in approximately 2001 when it is rumored that a large chunk of cement broke off and fell within the interior of the building. It is said to have landed on and damaged an employee’s desk during the night, and was found the next morning when the employee arrived at work. Chunks of falling concrete remain a danger, which is why many parts of the building are wrapped with netting, and scaffolding covers some sidewalk walkways. Later that year an engineering consultant found that the building was deteriorating due to deferred maintenance, and that many of the building’s systems such as heating and air conditioning, its elevators, etc. were nearing the end of their life-cycle. 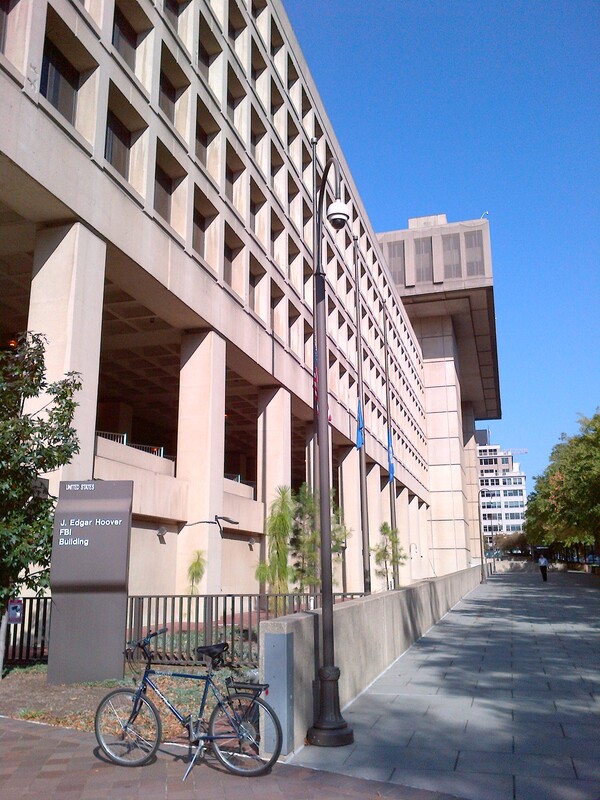 The consultant rated the building as in “poor condition” and said it was not at an “industry-acceptable level.” Four years later, another consultant reported that due to the building’s inefficient interior layout, it could no longer accommodate the FBI’s workforce, which by that time was scattered in 16 additional leased properties throughout the D.C. metropolitan area. This problem was compounded by the need for recommended security upgrades, building systems replacements, and other necessary renovations. At that time, the General Services Administration estimated that it would take three years to develop a replacement headquarters and identify a site, and another three years for design, construction, and to move-in. 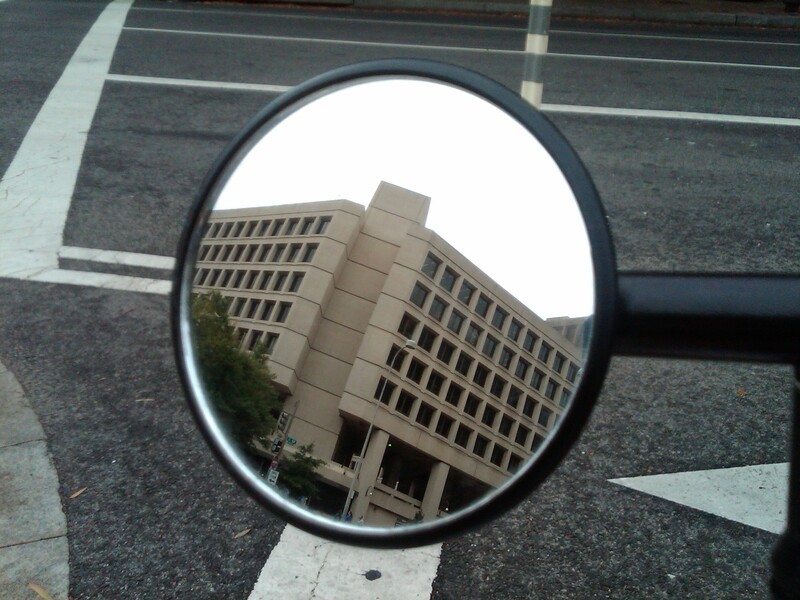 The FBI began studying the costs and logistics of moving its headquarters later that year. 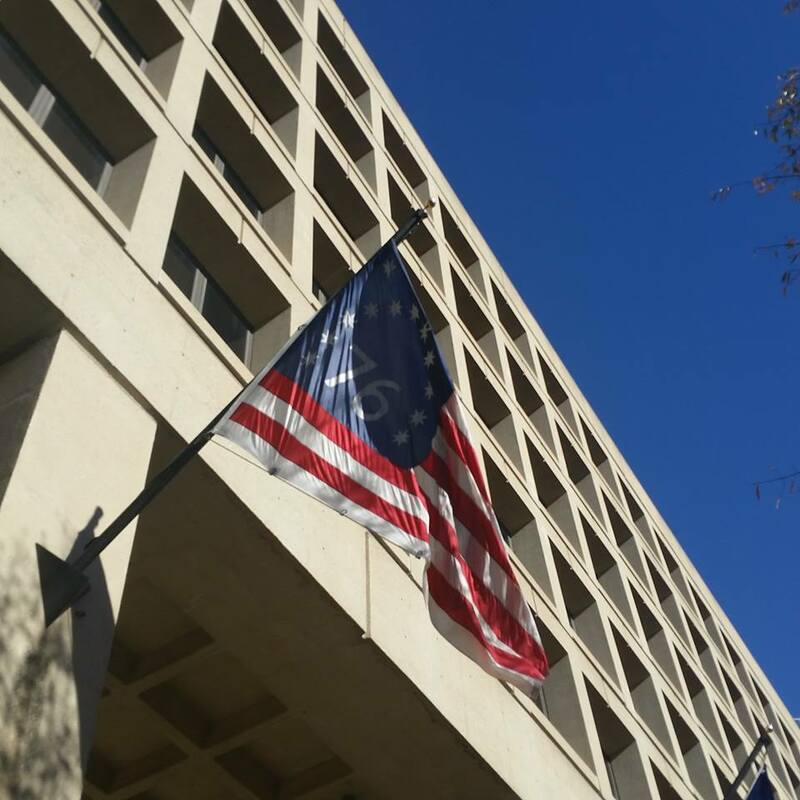 It has been a decade since the estimated six-year process was initiated, and current estimates are that it will take another ten years before the FBI will be able to move into a new headquarters building. But then again, despite all the studies and money already spent, the move may not happen after all. 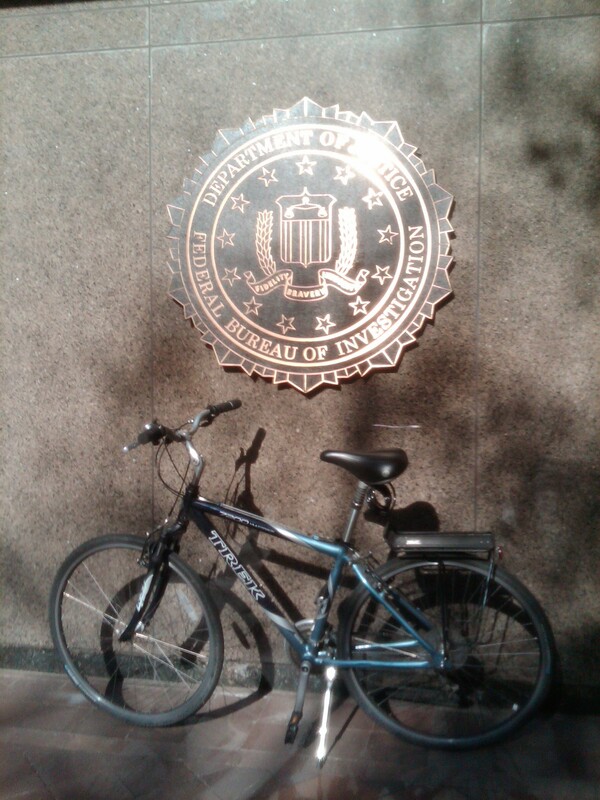 In January of this year the U.S. Congress passed the “Consolidated and Further Continuing Appropriations Act of 2015.” In a brief and mostly overlooked portion in Section 517 of the Act, wording was slipped in which specifically states, “Any consolidation of the headquarters of the Federal Bureau of Investigation must result in a full consolidation.” In order to comply with this requirement of the new law, the FBI will have to consolidate all of the employees and functions that are currently located in the headquarters building as well as the other 16 leased properties into any new building. The problem is, plans for the new building are that it will be approximately 2.1 million square feet. 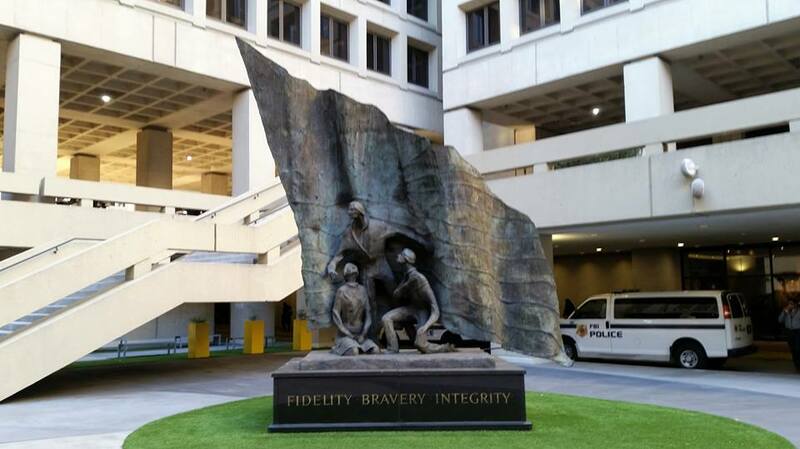 So a new building is being pursued because the current building is inadequate for the size of the FBI workforce. But the proposed new building will be 700,000 square feet smaller than the current building. 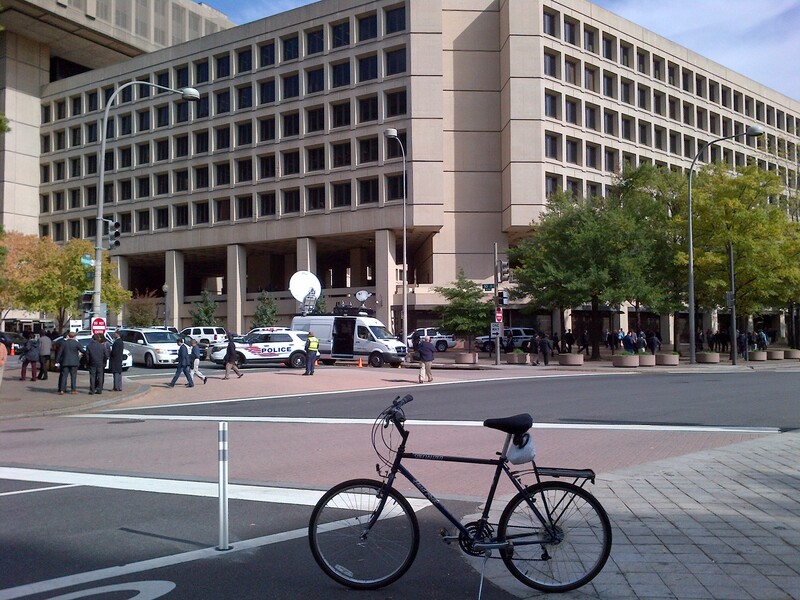 I guess we will just have to wait and see whether or not the FBI will be able to move its headquarters. On the bright side, though, if the Bureau is not relocated to a new headquarters building it will give them the chance to finally finish construction of the one they’re in. 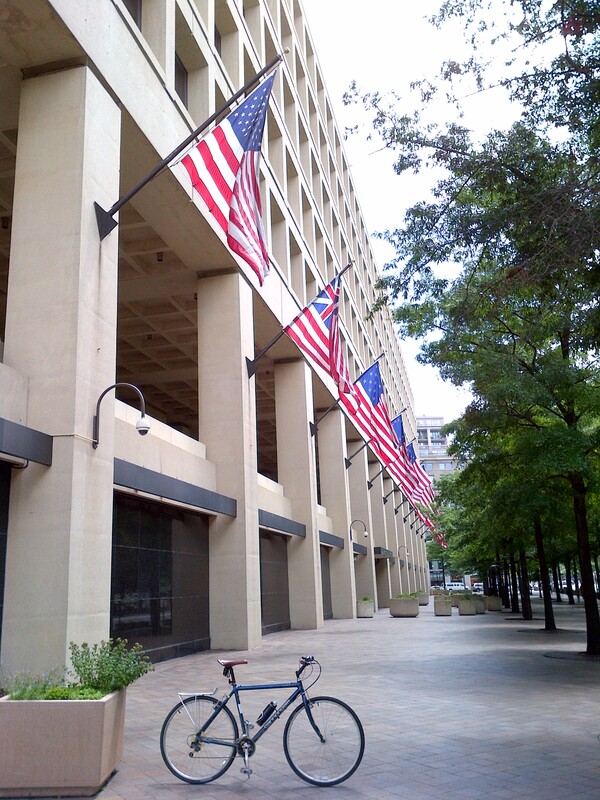 The construction of FBI Headquarters was nearing completion at the time Director Hoover passed away. And in what some say was intended as a slight toward the former Director after his death, funding was never appropriated to finish construction on the exterior of the building that was to bear his name. 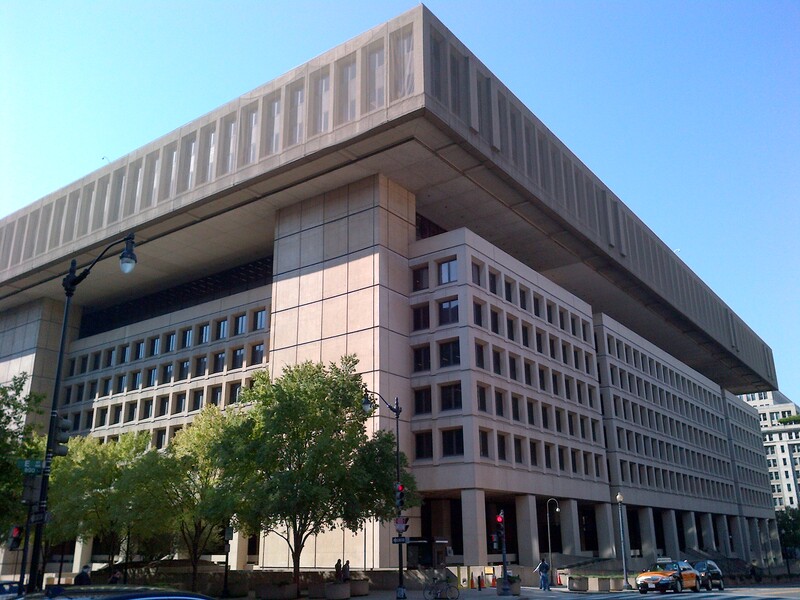 As a result, the façade of the J. Edgar Hoover Building is riddled with hundreds of holes where sheets of polished granite or marble cladding were to have been attached, and the crude concrete exterior of the building has remained in an unfinished state ever since. It was 38 years ago today that Orlando Letelier, a former Chilean government minister, diplomat and ambassador to the U.S., was assassinated here in D.C. I was only 14 years old at the time, but I remember it happening because of the unusual and audacious method by which he was killed – a car bomb. Marcos Orlando Letelier del Solar was a Chilean economist, Socialist politician and diplomat during the presidency of Socialist President Salvador Allende. After a military coup d’état led by General Augusto Pinochet overthrew the government in 1973, Letelier was arrested. He spent approximately a year in prisons and various concentration camps, including the infamous Dawson Island, which was used by the Allende regime to house political prisoners suspected of being communist activists. After diplomatic pressure from Venezuelan government prompted his release, Letelier moved to D.C. at the invitation of writer and film-maker Saul Landau to work at the Institute of Policy Studies, a left-wing think tank. He then became the leading voice of Chilean resistance to Pinochet, lobbying Congress and European powers to stop trading with the military dictatorship of American-backed General Pinochet. 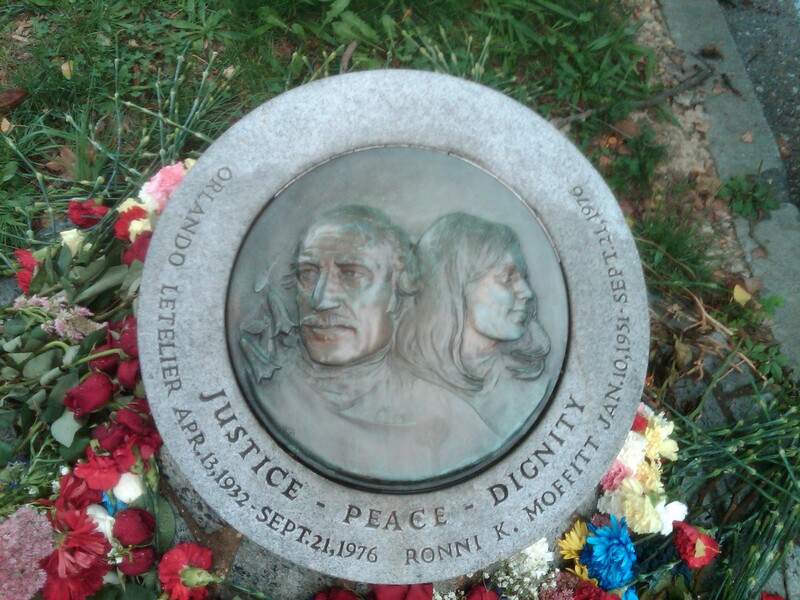 Approximately a year after coming to D.C., on September 21, 1976, Letelier was on his way to work like any other day, except that he was giving his assistant, Ronni Karpen Moffitt, and her husband, Michael, a ride because their car had broken down. Letelier was driving, while Ronni was in the front passenger seat and Michael was in the rear behind his wife. As they rounded Sheridan Circle in northwest D.C. at approximately 9:35 am, a violent explosion under the car lifted it off the ground and caused it to collide with another car that happened to be parked illegally in front of the Irish embassy. Michael was able to escape from the car by crawling out where the shattered rear window. Assuming Ronni was alright when he saw her get out of the car and stumble away, he made his way around the car to check on Letelier, who was still in the driver’s seat. 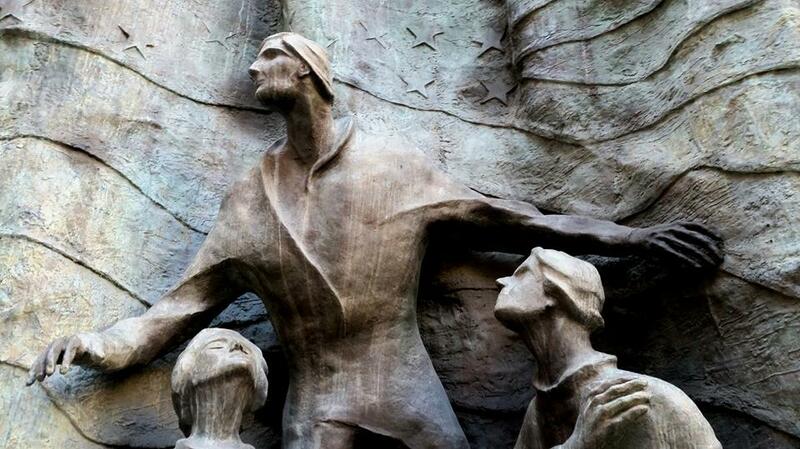 Letelier’s lower torso was blown away and his legs were severed, but he was still alive. Both Ronni and Letelier were taken to the George Washington University Medical Center. Letelier succumbed to the massive injuries suffered in the explosion approximately 20 minutes later. Ronni’s died a little over an hour later, her larynx and carotid artery having been severed by a piece of shrapnel from the bomb. Michael suffered only a minor head wound. An FBI investigation determined that the assassination had been orchestrated by agents of the Dirección de Inteligencia Nacional (DINA), the Chilean secret police, led by an American named Michael Townley, who was a DINA U.S. expatriate who had once worked for the CIA, along with right-wing Cuban militants who they had hired to carry out the hit. Townley was extradited to the U.S., and agreed in a plea deal to provide evidence against his co-conspirators in exchange for pleading guilty to a single charge of conspiracy to commit murder and being given a ten-year sentence. Townley’s wife, Mariana Callejas, also agreed to testify in exchange for not being prosecuted. The Chilean government refused to extradite two DINA officials who were involved, but they were tried and convicted in Chile, and sentenced to between 6 and 7 years in prison. The Cubans were tried in the U.S. and sentenced to life in prison. Soon after the trial, Townley was freed under the Witness Protection Program. General Pinochet, who died in December of 2006, was never charged or brought to trial for the murders, despite CIA evidence implicating him as having ordered the assassination. 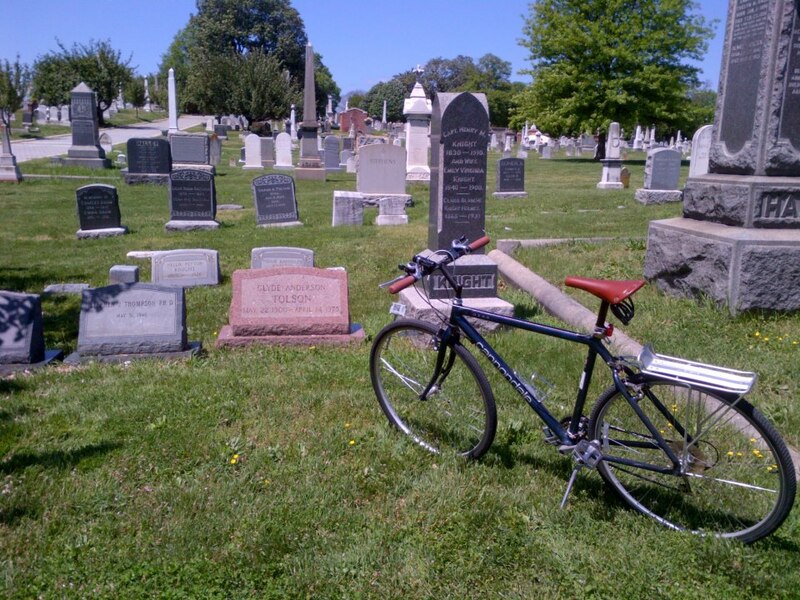 On this bike ride, I rode to the Letelier-Moffitt Memorial at the site of the bombing in which they were killed. 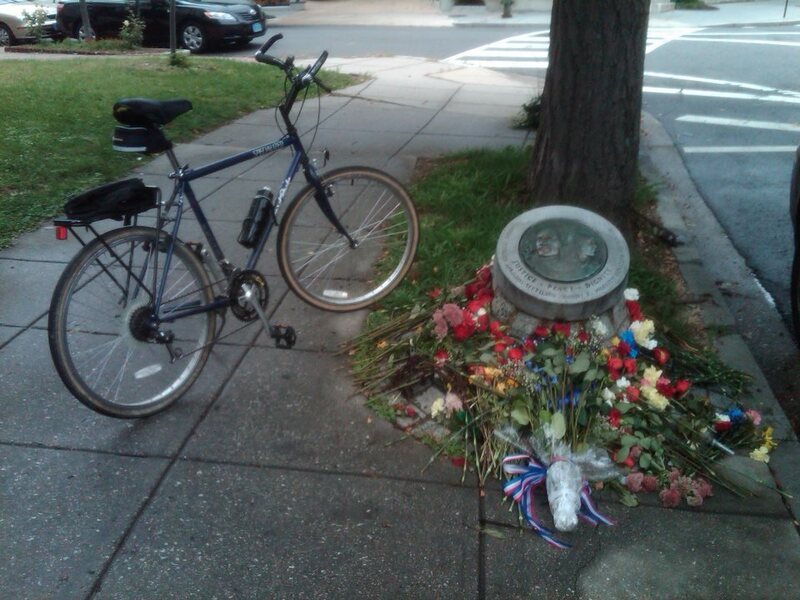 The memorial is located in the southwest area of Sheridan Circle, near 23rd Street and Massachusetts Avenue (MAP) in northwest D.C.’s Embassy Row neighborhood. 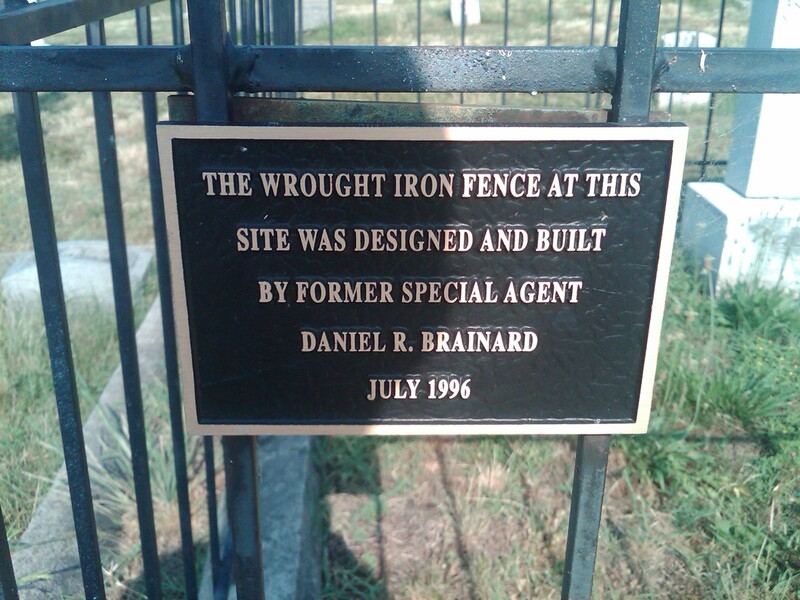 The memorial consists of a small brass plaque embedded in the grass between the sidewalk and the curb where they were killed, near the Irish and Romanian embassies. Arguably one of the most powerful men in the history of D.C, he was never elected to public office. He was born in D.C., but no birth certificate or public record was ever filed, despite the fact that it was legally required at the time. He went through the D.C. public school system, and attended college in D.C. as well at The George Washington University, where he obtained both a Bachelor of Laws degree and a Master of Laws degree. 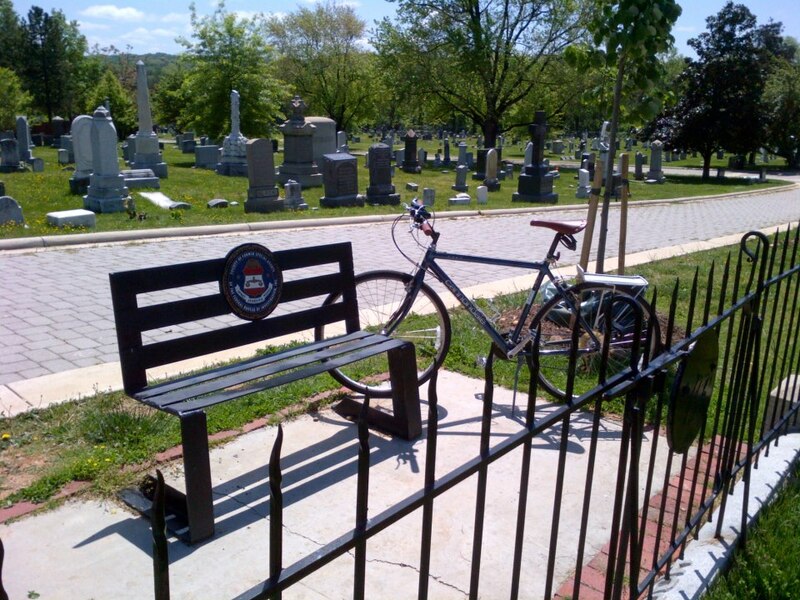 He lived his entire life in the nation’s capitol, died here, and is now buried at Historic Congressional Cemetery in D.C.’s Capitol Hill neighborhood (MAP). That man was J. Edgar Hoover. Hoover was born on New Year’s Day in 1895, and died on May 2, 1972. Appointed in 1924 as the Director of the Bureau of Investigation, the predecessor to the FBI, he was instrumental in founding the FBI in 1935, where he became its first Director. He remained the Bureau’s Director for 37 years, until his death in 1972 at age 77. 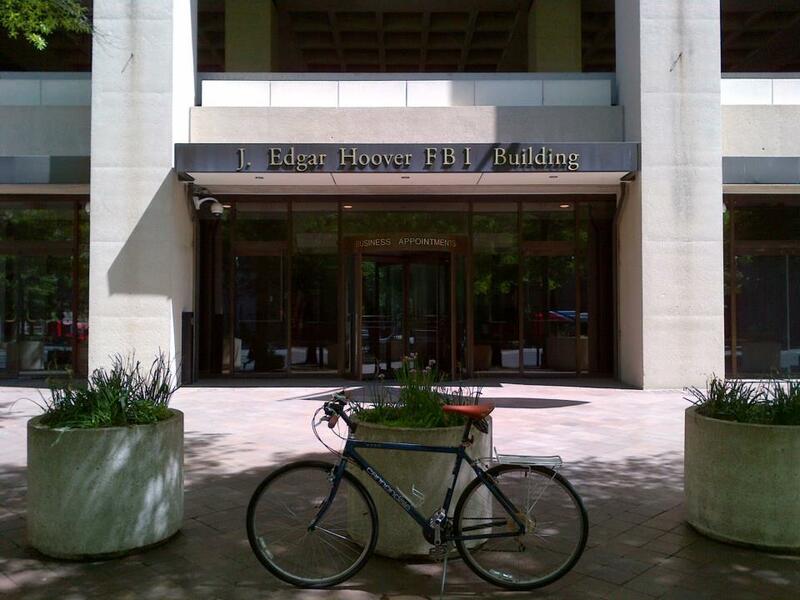 Hoover’s professional legacy at the FBI is mixed. He was noted as being capricious in his leadership. He singled out FBI Agents who he thought “looked stupid like truck drivers,” or that he considered “pinheads.” He frequently fired FBI Agents, and also relocated Agents who had displeased him to career-ending assignments and locations. And it is because Hoover’s actions came to be seen as an abuse of power, FBI directors are now limited to one ten-year term. However, Hoover is also credited with building the FBI into a premier crime-fighting agency, and with instituting a number of modernizations to law enforcement technology, such as a centralized fingerprint file and forensic laboratories. Hoover’s private life is also subject to interpretation and speculation, and opinions of the man are varied as well. Beginning decades before his death rumors began circulating that the lifelong bachelor was a homosexual. Some historians speculate that Clyde Tolson, Hoover’s second in command at the FBI, and who also never married, may have been his lover. Other scholars dismiss rumors about Hoover’s sexuality, and his relationship with Tolson in particular, as unlikely. Still other scholars have reported the rumors without expressing an opinion. 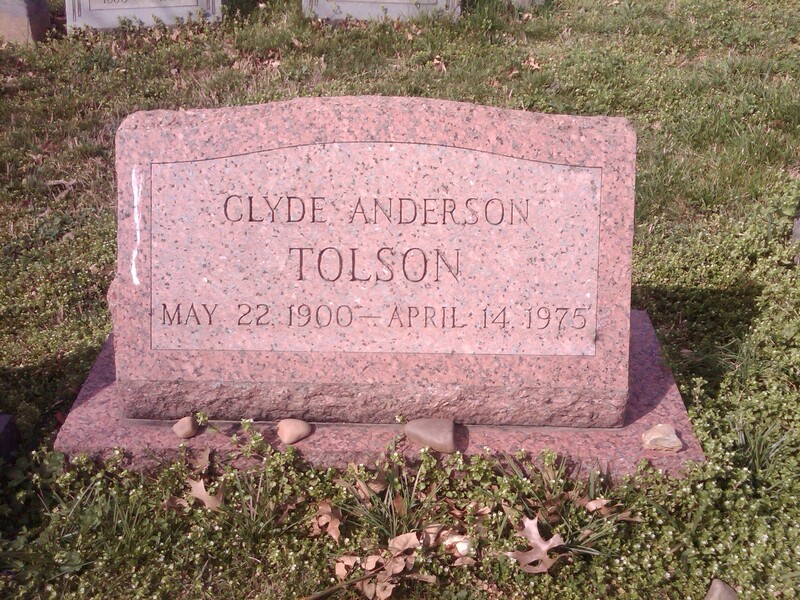 Clyde Tolson is best known as the protégé and companion of Hoover, who described Tolson as his alter ego. The men worked closely together during the day and, both single, frequently took meals, went to night clubs, and vacationed together. Hoover bequeathed his estate to Tolson, who moved into Hoover’s house upon the FBI Director’s death, and also accepted the American flag that draped Hoover’s casket. 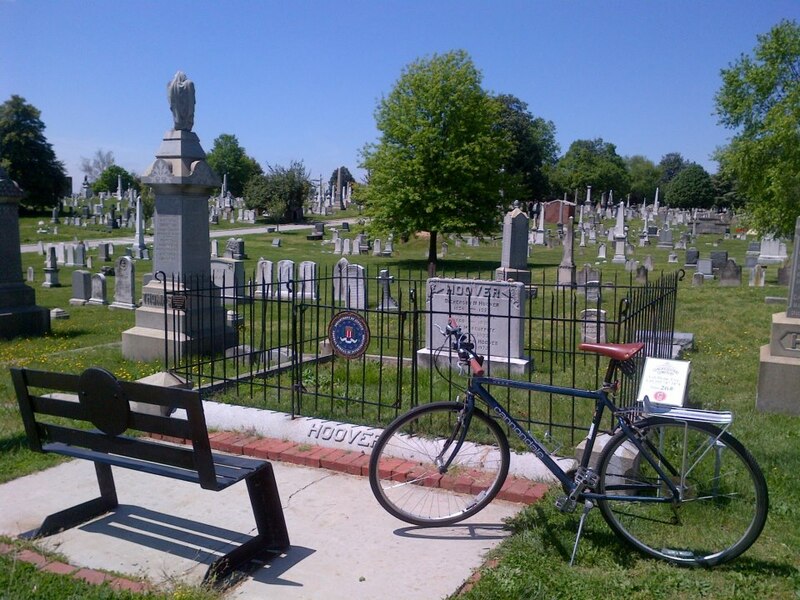 Tolson’s gravesite is just a few yards away from J. Edgar Hoover’s grave. Even after his death, Hoover’s presence loomed large in D.C. By regulation and custom, only Presidents, military commanders, and members of Congress are granted the honor of lying in state in the U.S. Capitol Building‘s rotunda. Of the 31 people, including 11 Presidents, who have been granted this honor, there has been only one exception. That exception was J. Edgar Hoover.